Sto. Rosario Parish is located in Pacita Complex I, San Pedro, Laguna. The people who live in Pacita are called “Pacitans.” Pacita belongs to the Diocese of San Pablo. The Parish was built thirty one years ago. It is older than me so I was not able to see with my own eyes how it grew standing to where it is now. Before it was constructed, the community held regular Sunday masses in an open area using only a tent. 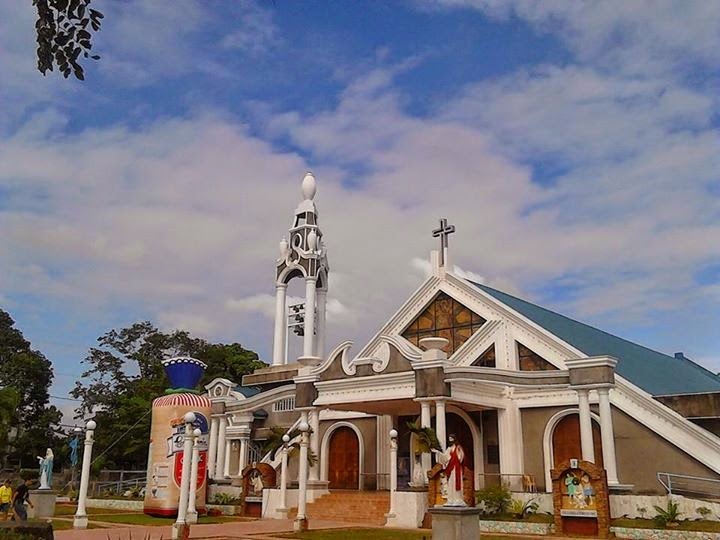 This Parish is characterized as “Pacitans’ Home of Peace.” Although most people who live there came from different places, they are said to be as united as the Rosary beads. They helped each other volunteered, raised fund, shared resources, and prayed together to build the Parish. Sto. Rosario Parish signifies the communed effort of those people who were behind its success. Even though I would not be able to verify with my own eyes, I can say that the sense of “togetherness” was present among Pacitans back then. What about in the present? That is the question. The structure has three big wooden doors at the back. There are three sliding glass doors on the right and on the left side. The altar is gold painted and has a backdrop of the image of Our Lady of the Most Holy Rosary. There is a larger crucifix above it. The tabernacle is at the center. There is a Bible enshrined at the left and an image of a saint at the right. The image changes from time to time depending who is in-season. There is a simple, moderately sized table with small crucifix on top of it. The Priest’s chair is at the right side of the table. The Priest’s chair is in between two smaller chairs. The Sacristy is located at the farthest right of the altar. The lectern is located at the left side of the altar. There are seven masses during Sundays, three in English and four in Filipino. In addition to that, there are two anticipated masses on Saturday evening. One in English and the other is in Filipino. During the anticipated masses, the first one is standing room and the second one is almost full. During Sundays, the first six masses are standing room and the last one is almost full. The seating capacity of the Parish is approximately 700 persons. Thirty minutes before the mass, the Parish is almost empty. The ones present are the cleaner, projector operator, altar servers, choir, mother butlers, and very few mass attendees. Slowly, one by one, Parishioners are already coming. Most attendees in the morning are families and people who belong to 40 and above age group. Most attendees in the later part of the day are individual persons, young professionals and very few youths. Upon entering the Parish, only few people genuflected facing the direction of the Blessed Sacrament. Most people immediately look for the electric fan then find an empty seat that is not too warm. After selecting a comfortable place, some are quiet but there are more who talk with their companions. They rarely talk with other Parishioners except to ask if their preferred seat is already taken. Pacitans are working class. Most are government or private employees in Makati, Ortigas, Quezon City, and other similar places. Even though they have their regular day jobs, they still give time to attend mass and worship the Lord. I asked myself, “What is their reason for attending the mass? Do they really know that they are worshipping God in that way?” I did not ask anyone there because they might think I am crazy. As I look around, I saw familiar faces. I saw many people who went to the same Catholic High School as me. Do we really come together there to express our faith? Or is it just something that we are used to? It seems like we are robot. We are participative because everything that we need to sing, recite, and pray is flashed on the screen. We have presiders who create slideshow presentation of their homily. It feels like we are just reciting and not praying. We stand, sit, and kneel when the commentator says so. The commentator told us to sit when we were supposed to kneel. So we sat unknowingly that we should kneel. This means that I am also guilty of having no presence of mind during mass. Our Parish is really blessed with very good Presiders. Aside from our Parish Priest, there are also regular guest Priests. They are really good communicators of imparting faith, love, wisdom, and enlightenment to us Parishioners. They also physically present themselves well. They do dress properly with slacks and shiny black shoes underneath their alb and chasuble even it is hot. They state the name of the Pope without the number and they knew the first Christian name of our Bishop. One weakness of the community is that there is very few youths who attend mass. If those baby boomers (Elderly people) are already with our Creator, who will be attending the mass? Aside from being very few, the youths of today are very playful even during the mass. While I was observing, there were five girls in front of me probably in high school. Four of them are doing boisterous acts and not even kneeling during the consecration. There was even a kneeler and they were disrupting their one friend who was being a good mass goer. I was about to scold them and tell them to respect the consecration but I controlled my anger. It will be me who will become disrespectful during consecration. I was trembling in anger but I kept calm on the outside. I wanted to ask them if they were Catholics or Christian but I let it go. I also wanted to ask their age and tell them to act like one. I still let it go. After “Lamb of God,” those four girls were still unruly. I said to myself, “I cannot take this kind of behaviour anymore.” I told them, “Miss, please behave.” It was my first time to see that kind of barbaric attitude during mass. I was thinking why the Mother Butlers did not call the attention of those noisy girls? The Mother Butlers were sitting behind me. I am very sure that they saw those behaviour or they were also busy chatting with themselves. Another weakness that I noticed is that the Parish workers give better service if the Presider is the Parish Priest. I theorized that one reason is that our Parish Priest made a joke when there was no choir. He said, “Walang choir ngayon, baka hindi nagising. Sana di na sila magising.”(There is no choir today, maybe they were not able to woke up. I wish they would never wake up). Speaking of the choir, I was taught that the choir gives accent to the mass. However, during my observation, there are timeslots that the choir seems to be doing a concert. Instead of helping me to be drawn more to worship the Lord, it makes me listen to them. I do not really considered that a weakness though. Or is it? Anyway, moving on, I also noticed that if the Presider is not the Parish Priest, there is a lacking of altar servers and Extraordinary Ministers of Holy Communion (EMHC). I do not want to judge but it is a trend in all the masses. I think attending mass in our community is like watching a movie in a theatre. People are slowly filling the seats. You do not know anybody except if you are with your friends or family. There is an opening and there is a closing. At the end of the show, people simultaneously and hurriedly go to the exit. In less than a minute at the start of recessional song, the Parishioners head out their own ways. The Parish is again almost empty. Maybe even if it is full of people, it is still empty. I trust that the Church Workers have a passion in service. They already have a heart of a volunteer that is why they are there. They just need to realize in their own that they do not volunteer to please the Parish Priest. They are there to please the Lord and to contribute to the betterment of the community worship. It is not about the Parish Priest. They are serving the Parish because for them it is the same as serving God. They are serving well not because of fear but because of love. Having love in service has a great role in the brighter future of our community. Pacitans were truly united in faith before. I believe that we can still be in the future.